It is very simple to use and maintain. All you need to do is fill the chamber with water, insert instruments, close the door, turn the timer on, and walk away. The 777 has fast cycle, avoiding the cost of buying extra sets of instruments. 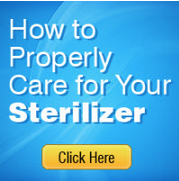 This sterilizer is available only as Pre owned.